SEVASTOPOL, Crimea -- When a scandal-prone Italian and a combative Russian get together on recently annexed territory, you might expect them to uncork a bit of controversy. Russian President Vladimir Putin (R) and Italian former Prime Minister Silvio Berlusconi visit archaeological excavations outside Sevastopol, Crimea, on September 12. 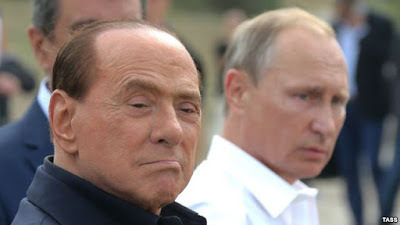 Less than a week after their demonstrative visit to Crimea, Russian President Vladimir Putin and former Italian Prime Minister Silvio Berlusconi stand accused of drinking one of the forcibly annexed peninsula's oldest surviving bottles of wine. Crimean prosecutors now exiled in mainland Ukraine say the two leaders tasted a 240-year-old bottle of Spanish wine produced during the 18th-century reign of Catherine the Great and brought to Crimea by Count Mikhail Vorontsov. The wine-loving count served as governor-general of Crimea for more than two decades in the early 19th century. The Massandra winery that he established in Crimea, including his private wine collection, was taken over by Russia when it seized Crimea from Ukraine last year. Prosecutors in Ukraine have now opened a criminal case over the incident involving Putin and Berlusconi, citing "large-scale misuse of property." Russian newspaper Promyshlennie Vedomosti reports that Berlusconi asked whether he could taste the wine during a tour of the winery. The newspaper, quoting a witness, says Massandra's new pro-Russian director, Yanina Pavlenko, then uncorked the precious bottle of 1775 Jeres de la Frontera for the high-ranking guests. Prosecutors say the bottle was worth more than $90,000. At the time of Crimea's annexation, the winery owned five bottles of Vorontsov's famous Jeres. Two more bottles were sold at a Sotheby's auction in 1990 and 2001. The wine fetched $50,000 at the 2001 auction, which took place with the personal authorization of then-President Leonid Kuchma of Ukraine. In June 2014, the Massandra winery was placed on the list of EU sanctions after passing into Russian hands.